Now that's a long way - from sun rising to sun setting, that's how far God has removed our sins. But the key word is removed. When we sin and come to God in repentance, God doesn't just forgive our sin; he purifies us of all unrighteousness. What was unholy in me is made righteous in him. What was impure is now clean. What was stained is spotless. Why? How? 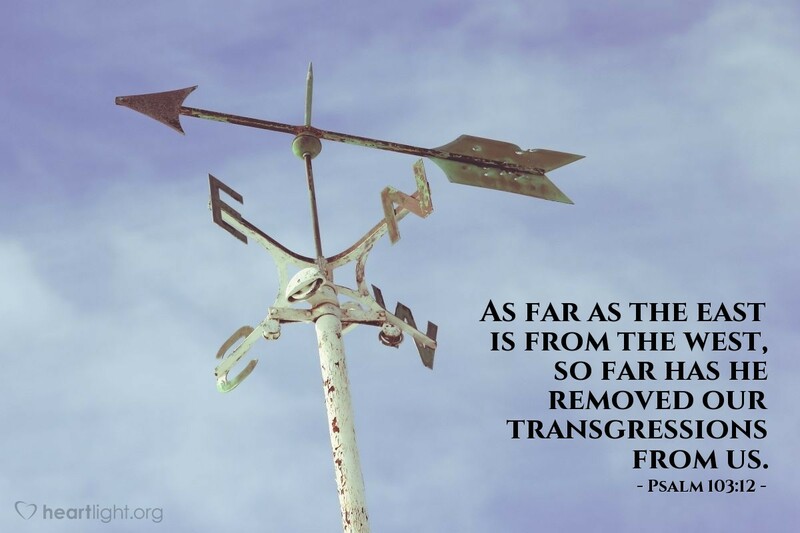 We can now see more fully what the Psalmist could know only in part. God doesn't see our sin, but Jesus' sacrifice. His blood purifies and cleanses us! Our sin is gone and we are clean. Father of mercies, thank you for not only forgiving my sins, but for removing them. I thank you that I can stand before you holy and without fault because of the blood of Jesus and your gracious desire to forgive. I now ask, Righteous Father, that you strengthen me with your Holy Spirit so that my conduct will reflect your estimate of me in Jesus. In the name of the Christ, your Son and my Savior, I pray. Amen.